You deserve the best, and so does your laptop. Deck it out in a luxurious leather sleeve, with our unique MedSoc logo printed on it. It fits a 13 inch MacBook perfectly, and is guaranteed to make all the other laptops jealous. You may not have your wits about you during a tutorial, but you'll definetly have your cards! 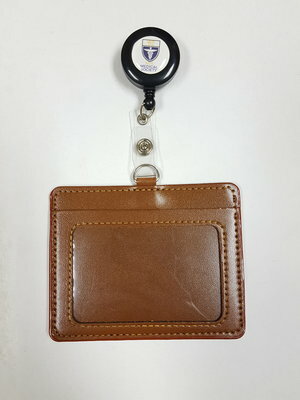 Keep them snug in this fashionable leather Card Holder with a Retractable Cord! With the MedSoc logo on the back, this is an accessory that goes well with any outfit. Black is the new black. 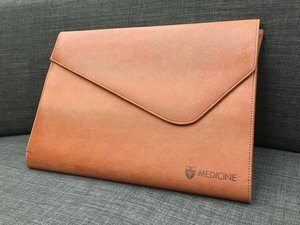 And with this classy leather bound Notebook with elastic closure, handy pen holder, and MedSoc logo printed on the front, you are bound (heh) to impress your Consultants during Ward Rounds, with your sense of style (along with your medical knowledge of course)!